Then one of the twelve disciples—the one named Judas Iscariot—went to the chief priests and asked, "What will you give me if I betray Jesus to you?" They counted out thirty silver coins and gave them to him. From then on Judas was looking for a good chance to hand Jesus over to them. Today is not only known as Palm Sunday but also Passion Sunday. We have two Gospel readings - Jesus entering Jerudalem on Palm Sunday and the Passion story from Matthew’s Gospel. Today I want to focus on the opening words of that second Gospel reading – chapter Matthew 26 verse 14. I want you to imagine for a while that Judas is here and wants to tell us what happened that first Good Friday. Let’s hear from Judas. Good morning! You may be wondering why I’m speaking to you this morning. I’m sure you all know about the part I played in the arrest and death of Jesus. I want you to know a bit more about my background and what happened almost 2,000 years ago. What happened to me can also happen so easily to you. I’m sure that when you hear the name "Judas Iscariot" you immediately think of someone evil, don't you? You can't speak my name without making it sound like a dirty word. But what do you really know of me apart from the fact that I betrayed Jesus to those who then crucified him? Well, let me tell you more. Now don't get me wrong I'm not going to try to justify myself for the evil I did. However, I think it will be helpful to you personally if you understand what led me to do what I did. ‘Judas’ was once an honourable name. One of Jesus’ brothers was named Judas (Matt 13:55). And one of great Jewish folk heroes is Judas Maccabeus, a great leader whose adventures are celebrated every year at the Festival of Hanukah. What I did has brought so much damage to the honourable name of Judas! In some places in the New Testament I am called "Satan" or "the Antichrist" (John 6:70, 17:12). You know me as the one who betrayed Jesus, but I wasn’t always a traitor. Listen, for 3 years I was a follower of Jesus. When Jesus called me to be one of his followers there was nothing but love and excitement in my heart – I had no intention of betraying him. Jesus warned us that following him wasn’t going to be easy, and we believed him but at that moment it didn’t matter. I was picked to be the treasurer of the group probably because they knew I was a careful spender. I carried the moneybag and I admit that I occasionally dipped into the bag for something I needed for myself. As Jesus and the twelve of us walked from place to place and talked, I could see that Jesus loved me even though he knew I was dishonest. Even when I turned my back on him and betrayed him, he still loved me. Well then, you might ask, what went wrong? Why did I betray Jesus to his enemies? As I said it certainly wasn't my original intention. It was a gradual development. There were a number of things when put together led me to do what I did. I'm telling you this so that you can see how easily it can happen to you too. Firstly, like a lot of other people at that time I had the wrong idea what kind of Messiah Jesus was going to be. He was to be a liberator, one who would set his people free. You can imagine how my hopes soared when Jesus was hailed a king as he rode into Jerusalem on Palm Sunday. But as the week went on my high hopes turned to disappointment. Jesus had no intention of using his power to strike down his enemies and establish himself as king. I wasn’t alone in this kind of thinking, the other disciples had this idea too and I would say that a large part of the crowd that called for Jesus to be crucified thought this as well. This idea dates back 500 years to the time when our nation was in exile in Babylon and everyone started to believe that the Messiah would re-establish a free independent Jewish kingdom. If only I had studied the Scriptures a little more carefully, especially the prophet Isaiah who clearly says the Messiah came to carry our sins and die in our place. I would have realised that he was not sent to give us political freedom, but freedom from all of our guilt and sin. If I had taken God's Word a little more seriously, I wouldn’t have been misled by others and by my own wishful thinking. I would have known more clearly who Jesus is and what God had sent him to do. If only I had listened to Jesus more closely and watched him as he touched lepers, healed the blind and the paralysed, raised the dead, I would have seen what kind of man Jesus really was – gentle, humble, caring and compassionate. If only I had read God’s Word more closely. That was my first mistake. The second thing that caused me to lose faith in Jesus was money. There were occasions when I got really upset with Jesus. I remember one time when Mary of Bethany poured that expensive perfume on Jesus’ feet (John 12:1-8). I pointed out that it could have been sold for 300 silver coins and put to better use. A silver coin was about a day’s wages. The wages for three hundred days was poured on Jesus’ feet! I was really confused and upset when Jesus defended this wasteful act. I said the money could have been given to the poor but Jesus saw right through me. I wasn’t thinking of the poor. I was just thinking of the money. That’s right, without me realising it my concern for money and security came between me and the love that Jesus had for me. My concern for money also blocked from view the love that others had for Jesus. My love for money - that was my second big mistake. And you all know very well what I did that really made my name "mud" forever. I had heard that Jesus’ enemies wanted to get rid of Jesus (Matt 26:3,4) so I secretly approached the chief priests who were only too happy to hear from one of Jesus’ special friends, a turncoat. They paid me 30 pieces of silver; on the condition I would lead them to Jesus. What I can't get over is how many chances Jesus gave me. At the Last Supper, I was right next to Jesus when he predicted that he was about to be betrayed. He said that the betrayer is the one to whom he gives the bread he has dipped in the dish. And I could have refused it, even at that stage. But no, I took it and rushed out to do my worst. Satan had taken control of me (John 12:27). 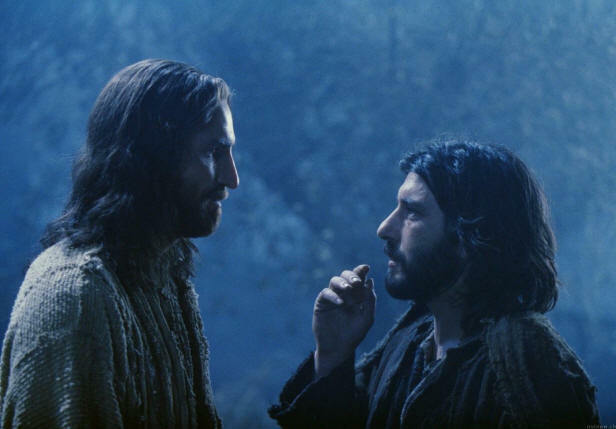 Even at the very last meeting that I had with Jesus in the Garden of Gethsemane when I led a band of temple guards to arrest him, he still called me "friend". I had just given the signal for him to be arrested, and yet he didn’t despise me for it. It would have been easier if he had spoken harshly and hated me for what I had done or threw me a punch. But his love for me burnt even deeper into me. I underestimated the priests and their thirst for the blood of Jesus. I had sentenced an innocent man to his death. Jesus had shown nothing but love to me and I had turned my back on him. When I saw what was happening, I tried to undo what I had done by offering to return the 30 pieces of silver to the priests. They wouldn't even listen. I felt I had reached the point of no return. I was overwhelmed with despair and guilt. That's my story. Without wanting to sound as if I’m playing down what I did, I believe you and I are not so very different. and you could be well on the road to becoming another Judas. Now that sounds a bit harsh, doesn't it? That may be so, and I’ve been deliberately blunt. Look what happened to me. I didn't intend doing Jesus any harm during the previous 3 years. I wanted to be a disciple, but there were too many things that crept into my life that made life with Jesus more and more difficult, if not impossible. None of the reasons that led me to betray Jesus were deliberate, they happened because I lost sight of what Jesus meant to me. In fact, in the end I fell into such remorse I couldn't accept the fact that he still loved me. He still accepted me as a "friend". I am telling you all of this so that you don’t fall into the same trap. Without a doubt, Jesus is a "friend". He wasn’t just saying it. And when I hear the word "friend" I understand someone who loves me with a love that will keep on loving me even though I don’t deserve it. I wish I had realised it then, that’s the kind of love that Jesus had for me. He is your friend. He died on the cross to free you from all your guilt and sin. He went through all the suffering and pain because of his love for you. And so when the burden of your sin gets too much or the trials of life become too heavy, you know you have a friend to whom you can turn. Things would have turned out differently for me, if I had recognised Jesus’ love for me. My friends, his love for you is unquestionable. Let nothing come between Jesus, your Saviour, and you.